Your little one deserves only the best. That's why our new dry food recipe is packed with tender, meaty pieces and complemented with flavourful vegetables. Specially formulated with 26 Essential Nutrients, it's the nutrition your dog needs, and the delicious taste of filet mignon your dog will love. Dietary Fibre supports a healthy digestive system. CESAR® Filet Mignon Flavour Food For Small Dogs 3kg is rated 4.0 out of 5 by 53. Rated 4 out of 5 by CRYSTALPON_366504387 from My dog loved this food. She couldn't get enough. Usually she waits for the humans to finish eating, and then when she knows she won't get our food, she'll grudgingly eat her own. That was not the case with this food, she absolutely loved it and ate it until it was gone. Immediately emptied her dish. I've never had a food she loved so much! Rated 4 out of 5 by SUSANUSK_366466321 from Our dachshund is extremely fussy. He loved it the first day, less excited the second day but ate it none the less. I made sure he had other options so I'd know if he liked it or was just hungry. He seemed to like it and ate it happily. He seemed to like the variety of size and shape. Rated 5 out of 5 by KATHYJON_366473572 from My dog loved this product more than any other dry dog food I have bought for her over nearly a decade. Thanks CESAR and Sample Source for the fabulous opportunity to sample a product prior to purchasing yet again. I will be buying this routinely for Lexi! Rated 4 out of 5 by SHERRIEAON_366475209 from I appreciate the sample, however, I'm not convinced that this food provides the best nutrition for my dog. I prefer to feed them grain free foods. They enjoyed it very much though. If my dogs had been sick and needed to gain weight, I'd use Cesar. 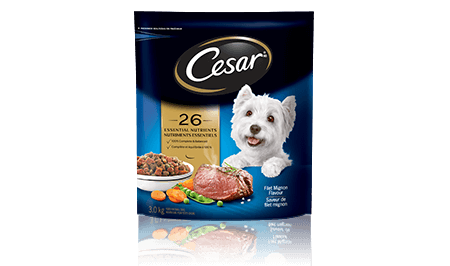 Rated 5 out of 5 by LORICON_366501475 from My fur baby loves Cesar Dog Food! This is the only band she eats. She loves that it has bite size pieces which are perfect for her little mouth. Thank you so much for the dog food. She is one happy girl eating her favourite food!!! Rated 5 out of 5 by KARENRAB_366465704 from My dogs are extremely finicky eaters, turn their noses up at dry dog food. I put Cesar down for them, they sniffed it, then carefully took one kernel, then they cleaned up the bowl. Finally I have found a dry food they like. Rated 4 out of 5 by MIHAELA_LON_366461913 from I am using Cesar dog food for over 2 yrs. I am feeding my dog the Cesar dry food, different flavors, the wet food and snacks as well. My dog is 3yrs old and seems that she likes them. So far she is a happy and healthy dog. Up to 0.5 kg or 1 lb 6 to 11 weeks - 1/3 cup per day 3 to 4 months - ¼ cup per day 5 to 7 months - ¼ cup per day 8 to 9 months - ¼ cup per day 0.5 to 1.4 kg or 1 to 3 lbs 6 to 11 weeks - 1/3 to 3/4 cup per day 3 to 4 months - ¼ to 2/3 cup per day 5 to 7 months - ¼ to ½ cup per day 8 to 9 months - ¼ to 3/8 cup per day 9+ months - 1/6 to 1/3 cups per day 1.4 to 2.3 kg or 3 to 5 lbs 6 to 11 weeks - 3/4 to 1 cups per day 3 to 4 months - 2/3 to 1 cup per day 5 to 7 months - ½ to ¾ cup per day 8 to 9 months - 3/8 to 2/3 cup per day 9+ months - 1/3 to ½ cup per day 2.3 to 3.2 kg or 5 to 7 lbs 6 to 11 weeks - 1 to 1 1/3 cups per day 3 to 4 months - 1 to 1 ¼ cups per day 5 to 7 months - ¾ to 1 cup per day 8 to 9 months -2/3 to ¾ cup per day 9+ months - 1/2 to 2/3 cup per day 3.2 to 4.5 kg or 7 to 10 lbs 3 to 4 months - 1 ¼ to 1 ½ cups per day 5 to 7 months - 1 to 1 1/3 cup per day 8 to 9 months - 3/4 to 1 cup per day 9+ months - 2/3 to 7/8 cups per day 4.5 to 6.8 kg or 10 to 15 lbs 5 to 7 months - 1 1/3 to 1 ¾cups per day 8 to 9 months - 1 to 1 3/8 cups per day 9+ months - 7/8 to 1 1/4 cups per day 6.8 to 10 kg or 15 to 22 lbs 8 to 9 months - 1 3/8 to 2 cups per day 9+ months - 1 ¼ to 1 ½ cups per day 1 Cup = 250 ml *This is a daily feeding guide and the amount can be spread out over 2 or more feedings during the day. An individual dog's requirements may differ from this guide. Provide fresh drinking water at all times. **Pregnant and nursing dogs can be offered up to 50% more than the highest amount listed in their weight category. CESAR® Filet Mignon Flavour Food For Small Dogs is formulated to meet the nutritional levels established by the AAFCO Dog Food Nutrient Profiles for all life stages.